I’ve been wanting to bake with lavender since attending a cooking class with my mom a year or two ago. Together with some other mother/daughter teams, we watched the chef slice and dice and elaborate on his slicing and dicing. Truth be told, I wasn’t all that impressed with the chef’s teaching style – especially when he implied that no home cook would bother to make their own curry. Clearly the man didn’t know his audience. Nevertheless, a few of his culinary ideas weren’t total garbage and a couple may have even found permanent residence in my kitchen. One is a shrimp grilling trick I keep meaning to share here, and another was the lingering memory of a lavender crème brûlée. I can count the crème brûlées I’ve had on one hand, so it’s not much to say that this one ranked near the top, but it stands out. Like salt minus all that, you know, saltiness, lavender provides a contrasting, even intriguing, je ne sais quoi to a dessert recipe. It seems counterintuitive that it’d be there, but then ends up being just so, so right. You’ll have to look elsewhere for that crème brûlée recipe, but before you do, make these shortbread cookies. I was lucky enough to find fresh lavender at the local farmer’s market, but dried should do the trick as well. When I went back for more lavender a couple weeks after first making these, I mentioned to the farmer how amazing his produce tasted baked with flour and butter. It’s the beauty of the market – getting to meet the farmer, comment on her tasty kohlrabi, or hear from him what he does with so much zucchini. I was surprised to hear my lavender grower didn’t even know the flowers could be used to culinary ends. How tragic that he’s been growing lavender all this time and didn’t even realize it could be more than just a pretty, fragrant potpourri. Not could, should. From here on out, seeing lavender in a bouquet will only make me think of missed opportunities. For you classy folks out there, these are perfect as photographed here – with a cup of tea and a few rays of the afternoon’s fading sunlight. For my co-workers, they were a refreshing cookie time snack, enjoyed with stories about bad haircuts or baby chicks. For me, well, I won’t lie. I ate a disturbing number of these as frozen, unbaked treats while curled up with a (sadly, not good) book. I changed the salt type and amounts, because I don’t keep $12 a teaspoon fleur de sel around and, if I did, it wouldn’t be going into cookies. Use 1/4 teaspoon salt for a more standard shortbread, or 1/2 teaspoon to get an extra kick. I liked these better with the 1/2 teaspoon salt. * Culinary lavender is available dried at fancy grocery stores or online stores. It may also be located at your local farmer’s market if you look hard enough. If using fresh lavender, rinse with water, pat dry and then remove blossoms from the stalks before using. Sift the flour and salt together in a small bowl. Combine sugar and lavender in the bowl of a stand mixer. Add the butter and mix until combined. Mix in vanilla briefly, followed by the dry flour mix until a dough forms. Shape dough into a disk, wrap in plastic and refrigerate for 20 to 30 minutes. Preheat oven to 350ºF while you wait. Bake cookies for 12 to 15 minutes, or until edges just start to brown. Be prepared for an incredible, refreshing aroma when you open the oven. Transfer to a wire rack to cool, if you can wait that long before sneaking a taste. Also, the new camera lens must’ve come in based on how extra-stunning those photos are – now I even more can’t wait for the SK Day in August!!! Glad you liked them. When I mentioned these and you said you’d probably never get a chance to make them, I knew I had to fix that. And yes, SK Day is going to be even better with the new camera. Maybe its presence will make up for the lack of any working space in my tiny little kitchen. Did you notice a certain other piece of new (to me) equipment as well? Your old stand mixer has been getting its fair share of work here. honestly, I wouldn’t have recognized that as my old mixer unless you pointed it out. it looks so much better through the lens of your camera than through the lens of my sleepy eyes as I try to shove it back in that awful above-the-fridge cabinet that’s juusssst out of reach. Also – what I loved most about these (or will keep loving as I consume them) is that lavender is such a striking taste – it’s like this thing that your brain is only accustomed to smelling, never tasting. So the first bite of my first cookie was like “Wait, what on earth? That’s strange,” followed by a second bite that was like “Oh, dude, lavender tastes goooood” That is my eloquent summer. I’m simply in awe – on so many levels. Count me in that group that has loved the smell of lavender for so long but never dreamed it could wind up making a cookie taste good. Your write-up, the pictures, the finished product – all absolutely amazing! Hi Ruth! Between the beans and the lavender, I’m loving the sound of your garden. I’ve heard that the open buds build up more bitter oils, so the closed buds are better. That said, I used closed for the first batch and mostly open for the second batch and didn’t taste a difference. 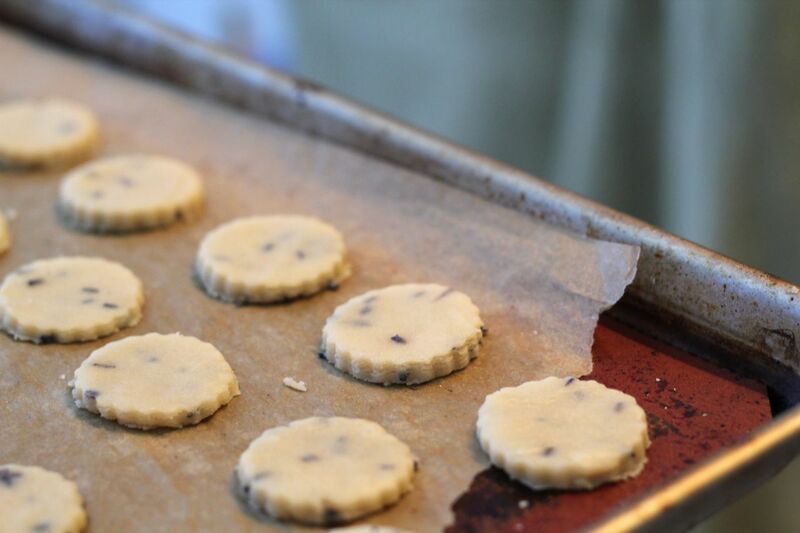 I’ve never baked with lavender before, but I absolutely adore shortbread cookies! Might have to give these babies a try very soon! I think we have the same cookie cutters… I’ve made all my lavender shortbread cookies with a similar cutter as the one you have above. Lavender and lemon are a heavenly pair, so I modified my cookies a bit and sprinkled lemon rinds mixed with sugar on top of the cookies right after they came out of the oven — the heat of the cookies allows the sugar to stick on the surface. Wow, that does sound heavenly! I’ll have to try that next time I make these. Thanks for the tip. Hope the cookies went over well! Although pretty much anytime I get a Christmas basket filled with cookies I’m over the moon.